New Delhi : Breaking news reveals that the social networking giant Facebook has discovered a bug that affected close to seven million users, exposing their photos to app developers. In a recent blog post, Facebook said that the bug affected people who used Facebook Login for third-party apps and granted them permission to access their photos. As per report, the new Facebook bug might have affected up to 6.8 million users along with up to 1,500 apps. “We have fixed the issue but, because of this bug, some third-party apps may have had access to a broader set of photos than usual for 12 days between September 13 to September 25, 2018,” Facebook said in a post. 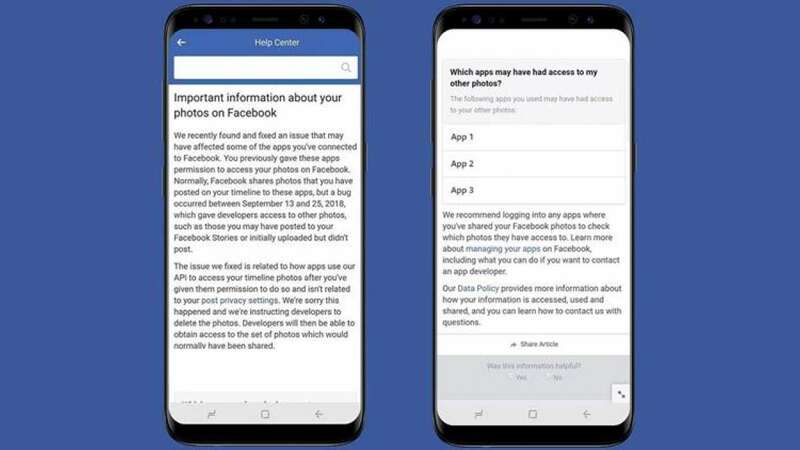 This technical bug not only exposed photos that were posted on Facebook by the affected users, but also photos that the user uploaded to the platform but chose not to post them due to technical or other reasons. However, the social media leader said it stores a copy of photos that the user uploads but does not finish posting it. In addition, it also exposed photos that were shard on Marketplace or Facebook Stores. Meanwhile, the company said that it will soon notify people who were potentially impacted by his bug and users can check if they have used any apps that were affected. The company will also work with developers to deleted photos from impacted users. As of now, Facebook is under investigation for certain security-related issues. It is known to all the its been a few months that the management has handled the Cambridge Analytica data scandal and now, a new issue arises, yet again. In the Cambridge Analytica data scandal, Facebook account data of 120 million users, including their personal chats, were allegedly compromised and put up for sale on the Internet, as per a BBC Russian Service report. Earlier, the company has posted about vulnerability in its code that lets people preview how their profile appears for others. Facebook claimed that 30 million users had their access tokens stolen by exploiting 400,000 accounts. The day-to-day Facebook scandal seems to be creating confusion in the mind of users, like should they continue their account or switch to some other safe social media website.